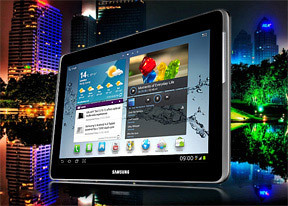 A 3.15 megapixel main camera that shoots 720p videos and a VGA megapixel front-facing snapper (with VGA video) is what you get with the Samsung Galaxy Tab 2 10.1. Provided that tablets aren't the most photography-friendly devices, it's probably as much as you are going to need anyway. Anyway, the two cameras are mostly there to cater for video-chatting and some augmented reality apps or games and the possibility to snap a thing or two as a reminder comes as a welcome bonus. The camera interface is an oversized version of what you find on the Galaxy Tab 7.0 Plus with the available settings on the left and the virtual shutter key and the video/stills toggle on the right. Here go a few samples to show you the image quality of the Galaxy Tab 2 10.1 camera. They aren't perfect, but they're pretty good for the 3 megapixel league - low noise, good detail and colors, but a slight bluish tint. We'll take a more in-depth look at the camera when we get a retail unit for a review. The camcorder interface is not much different, really. There are fewer options available here, but the layout is basically the same. We'll post video samples when we get a retail product. While the Samsung Galaxy Tab 2 10.1 doesn't have a slot for an S Pen, it still borrows a couple of apps from the Galaxy Note. The Pen memo app lets you scribble notes with your finger. You can use various pen styles and colors. There are undo/redo buttons and an eraser if you mess something up. You can insert images from the gallery, other memos and even part of a map. The S Planner is a custom calendar that features a lot of different views - Year, Month, Week, Day, Agenda and Task. It can sync up with several calendars (including the one from Facebook) and you can choose which ones are visible. The app is quite handy - in portrait orientation in month view, you can select a day and all events for that date will be listed at the bottom of the screen. The web browser on Android has always been excellent and the Ice Cream Sandwich version is no exception. Its interface has been revamped to better fit the new ICS layout and the tablet form factor. Tabs are available at the top of the screen, so switching between them and closing unneeded ones is very easy. In the top right corner, you'll find the an extended settings button, which brings out cool features like Find on page, Desktop view, Save for offline reading and several others. One option we really liked is the Brightness/Color setting - it offers several presets that adjust the screen to enable power saving. There's also the Inverted screen rendering option, which turns the web page black and white (with white backgrounds becoming black). You can further tweak this effect using the Contrast slider. The browser has a new trick too, one which it learned from its desktop sibling, Chrome. When searching for something, if the browser is confident you'll click on a certain search result (and with Google's algorithms there's a good chance you will), it will start preloading that page right away so that it opens faster if you do click it. You can set this to work only over Wi-Fi or turn it off completely. Another trick the Android browser snatched from Chrome is the Incognito mode - there's no global setting, but you can open Incognito tabs. If you don't like this desktop-like interface, you can enable Quick controls from the Labs settings, which reveal many controls (Tabs, URL, Reload, History, etc.) when you slide your finger in from the side. When we handled the first Galaxy Tab 10.1, it got us pretty excited. It was the dawn of Android tablets, and the experience was all new. Number 2 is somewhat short on thrills, but will get you from A to B at comfortable cruising speed. The Tab 2 10.1 doesn't seem like the gadget for people who already have a 10-inch tablet. If you're about to get your first tablet, or looking to upgrade to a bigger screen, the Tab 2 10.1 starts making sense. There's nothing official on pricing yet and we still have a lot of things to test before we can pass final judgment, but the Galaxy Tab 2 10.1 should do well in the 10" tablet midrange. The screen looks good, you get voice and data connectivity (plus video calling) and the tablet should have enough power to handle daily tasks.